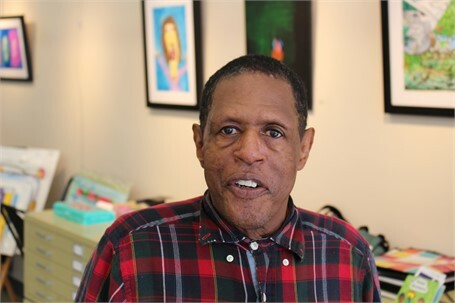 Raymond, with his gentle and kind demeanor, creates pieces of art that are full of movement, life, and detail. His work is wide-ranging, featuring subjects such as sweeping landscapes, unbridled wildlife, and portraits of people, both known and unknown. He draws inspiration from the world around him and from his love of comic books and graphic novels. Like Raymond himself, his work can be subtle and soft-spoken, with a lot going on beneath the surface.